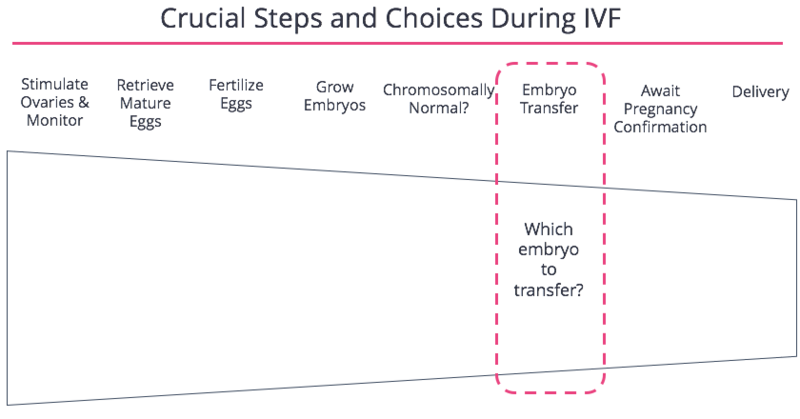 FertilityIQ: Which Embryo To Transfer? How Fast The Embryo Is Dividing: How quickly an embryo reaches a specific stage of development (like blastocyst or cleavage stage). 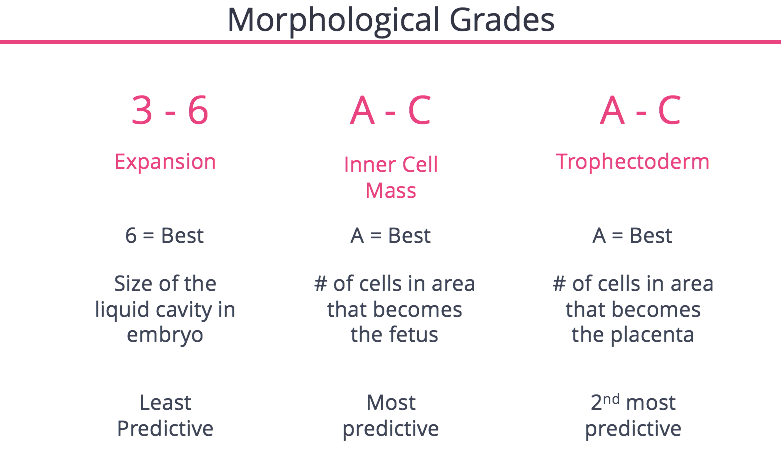 Morphological Grading: An embryologist’s interpretation of how specific regions of the embryo appear. Preimplantation Genetic Screening: Whether an outside laboratory believes the embryo has the appropriate number of chromosomes. Most experts will tell you that the speed at which an embryo reaches any given stage (like the blastocyst stage) correlates with its odds of success. Below is data from over 1,000 transfers of frozen-thawed embryos with results broken out by the day the embryos reached the blastocyst stage. 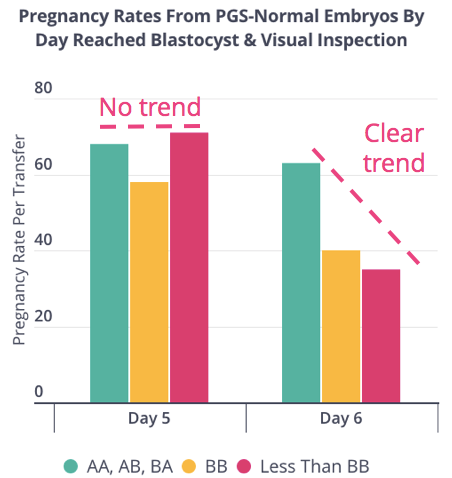 As you can see, embryos that reached the blastocyst stage in five days were more likely to lead to a birth. But, embryos that reach blastocyst in six days clearly have the potential to lead to births. For patients considering transferring cleavage stage embryos, the same holds true: the earlier the embryo reaches that stage, the more likely that it will lead to a birth. 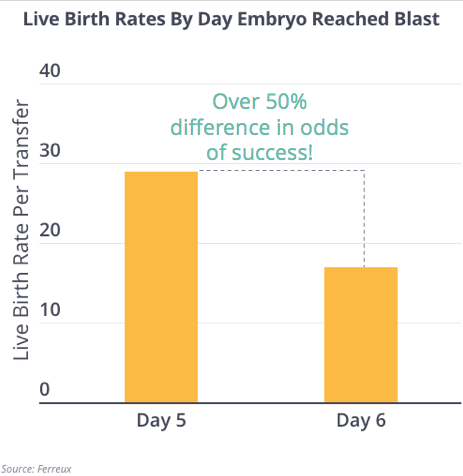 As an aside, while embryos reaching blastocyst on Day 7 are less desirable than those reaching by Day 5 or Day 6, a small but growing body of evidence suggests Day 7 embryos can also lead to live births and should thus be frozen for use. Today, most clinics discard embryos that don’t reach the blastocyst stage by Day 6. We believe that may be a mistake. Patients often have their their embryos graded on a scale that includes one number followed by two letters (like 4AB). This is called a morphological assessment. This combination of numbers and letters represent how “expanded” the embryo is, how many cells comprise the inner cell mass (which develops into the fetus) and the trophectoderm (which develops into the placenta). While “expansion” is listed first, it’s not the most important grade. That distinction belongs to the grade for inner cell mass, or what will become the fetus. An analysis of over 500 embryos at the University of North Carolina revealed that grading of the inner cell mass is most correlated with an embryo’s odds of success. Below is an excellent analysis from Japan of over 1,500 embryos in which embryos are classified into six buckets by their morphological grades. As you can see, there’s a predictable downward slope and thus correlation between morphological grading and the odds an embryo leads to a live birth. Yet, the less attractive embryos can still lead to live births, especially for younger patients. In fact, the better-looking embryos from a woman over age 38 typically succeed as often as the less-good-looking embryos from a woman under 33. As many experts will tell you, grading the inner cell mass and trophectoderm is subjective and some laboratories are tougher graders than others. That makes it hard to generalize how often an “AA,” “AB,” “BA,” “CC” (or what have you) embryo will lead to a live birth. Also, for this reason, it can be helpful to get an image of the embryos in case you want another laboratory’s take on which embryos are most promising. As we’ve covered before, genetic testing of the embryos can be an effective method to rule out embryos unlikely to lead to a live birth. While there is evidence that chromosomally-abnormal (“aneuploid”) embryos have led to live births, it’s very uncommon. For that reason, embryos that are chromosomally-normal (“euploid”) should be the clear priority. However, the vast majority of patients do not have genetic testing of their embryos done and so this information is only available to those prepared to pay about $5,000 for the results. It’s completely possible an embryo will fail PGS testing but grow quickly (for example reaching blastocyst on Day 5) and have great morphological traits (like a 6AA). Conversely, it’s possible an embryo passes PGS testing but, from a morphological standpoint, appears to be a poor prospect. In these circumstances, most experts agree that PGS results should trump morphological assessments, and that embryos that are euploid should be prioritized above all else. Once we’re working with just euploid embryos, there is a fair amount of disagreement on how important the day an embryo reaches blastocyst, or its morphological profile, truly is. One smaller study out of Italy showed no correlation between the day (Day 5 or 6) a euploid embryo reached blastocyst stage and success rates. However a more recent trial with nearly twice the amount of data showed Day 5 euploid blastocysts were more likely to lead to a live birth than Day 6 euploid embryos. Thus, if a patient has the option to transfer euploid Day 5 or 6 embryos, prioritizing Day 5 embryos makes sense. That said, euploid Day 6 embryos clearly still have value, and, as you can see below, lead to live births. Next, if someone is deciding between two euploid embryos that reach a stage at a similar time (meaning both became blastocysts on Day 5 or both on Day 6), morphological parameters are likely helpful in breaking the tie of which is better. 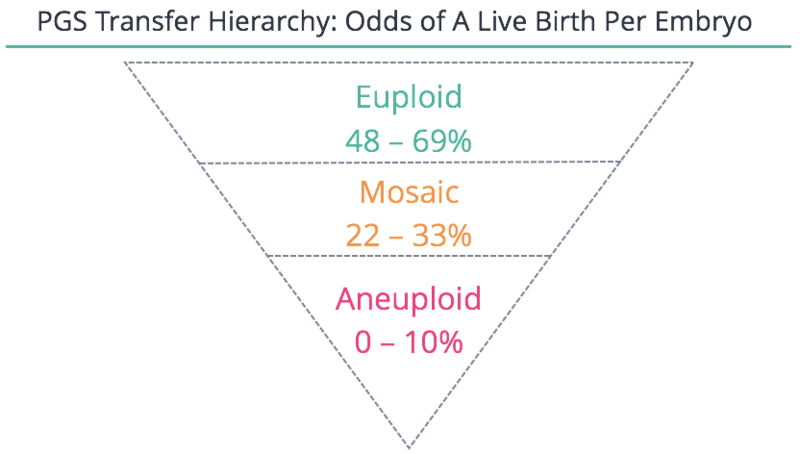 Below is data from a trial at Cornell that shows when its laboratory grades euploid embryos there is a clear correlation between the grade on visual inspection and the odds of a live birth. The limitation with this study (as with most of these) was that it was done in one center and it’s possible (and maybe even likely) Cornell’s grading and stratification bar is different than your clinic’s. For instance, a different laboratory in California noticed that when it graded euploid embryos, its grading was only useful as tiebreaker if the embryo reached the blastocyst stage on Day 6. 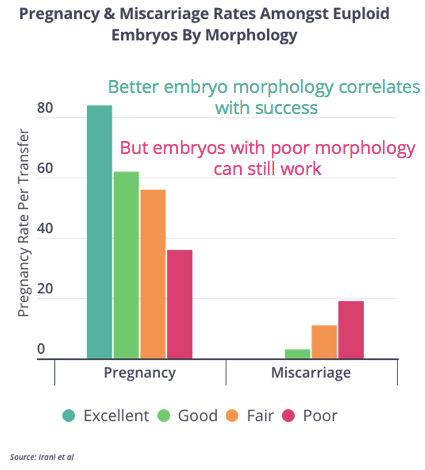 Ultimately, morphological parameters do seem to correlate with odds of success, but they are highly-subjective, do not accurately predict if an embryo will work, and likely take a backseat to PGS results and other factors like how quickly the embryos developed.